Bangladesh is starting to feel the load of over eight lakh Rohingya refugees as it has urged the international community to create pressure on the government of Myanmar to rehabilitate them. 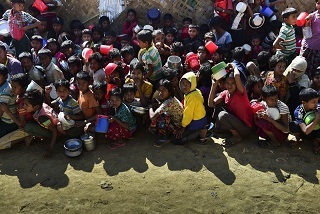 The Bangladesh government on Monday asked global authorities to impress upon the Myanmar government to creating a safe haven at Rakhine province of that country where they used to stay before being uprooted following attack by the army. According to reports, Dr A K Momen, foreign minister of Bangladesh has requested his Indian counterpart Susma Swaraj to formally place this proposal before the Myanmar government. He has also raised the issue when he called on Prime Minister Narendra Modi who reportedly did not made any comment but said it is an innovative idea. Reportedly Swaraj told Momen that the ‘foreign minister of Myanmar is your friend and you raise this issue with him’. However, Momen said it will get more importance to the Myanmar government if India places the case. He further said if the friendly nations take responsibility of looking after them then the Myanmar government may accept the proposal. Though the two countries could not reach into any final decision, it is learnt that, both the countries expressed grave concern over the Rohingya refugee issue and stressed the need for its early solution.